I just got the funniest phishing email. We've all got received those "desperate" please from "Miss Jane Oombambwa" in the Ivory Coast whose dead father has millions of dollars she needs to transfer to the U.S. with our help, right? Variations on this theme are so frequent they're cliché. Well here's a new one. I received an email (sent to "undisclosed recipients," of course) telling me that my Match.com account has been suspended and I need to re-connect "now." 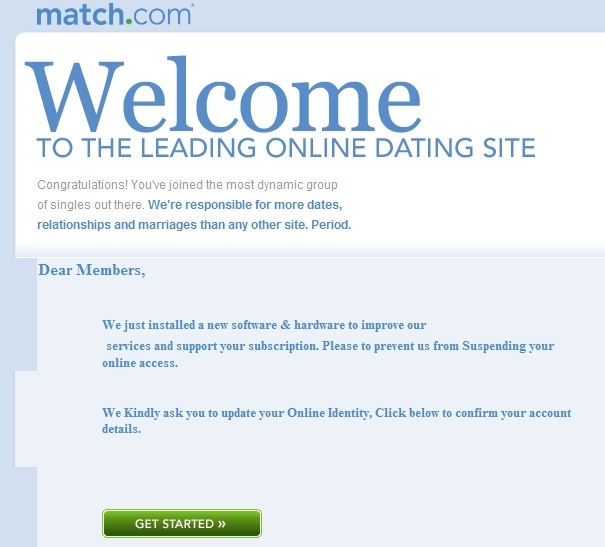 Match.com, of course, is a single's website (respectable, as far as I know). But of course a happily-married woman doesn't have accounts in such places (or she wouldn't be happily-married, n'est-ce pas?). "Congratulations!" it tells me. "You've joined the most dynamic group of singles out there." But, it continues, "We just installed a new software & hardware to improve our services and support your subscription. Please to prevent us from Suspending your online access. We Kindly ask you to update your Online Identity, Click below to confirm your account details." Anyway, I got a good chuckle from this before deleting it. I got one of these from Nigeria telling me a distant cousin had died filthy rich in Paris. I was the only relative they could find, and was the only heir to his fortune. If I would only send $600 to begin bank transfer fees, a substantial fortune would be mine. I laughed my tushie off. First, nobody in my family, distant or not, has ever gained filthy-richness. Second, there are so many of us that throwing a dart at any phonebook would find plenty of potential heirs. Third, NEVER give money to get money. If a bank lawyer doesn't come to your door and give you money for free, it's a scam. Even in the American public school System, I have Learned not To randomly punctuAte whatever Letters I feel like It.